Jesus called Philip and James to be among the twelve apostles who followed him. 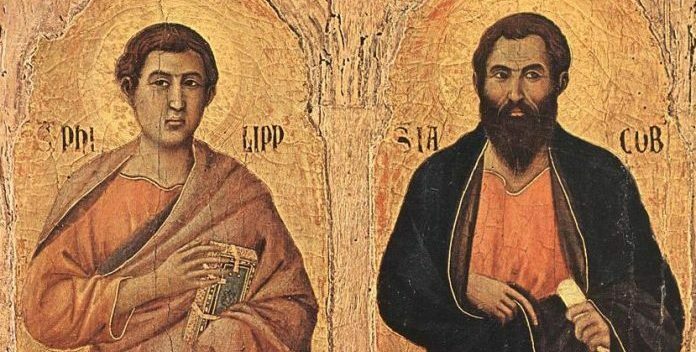 The apostles were regular people who said yes to following Jesus Christ. They sometimes argued among themselves and even expressed doubts, but Jesus did great things through them. Jesus calls us to follow him, too, and be his disciples. In John 1:43-46, we learn of Jesus calling Philip. Jesus said to Philip, “Follow me,” and Philip did just that. This call to follow Jesus echoes through the years to us. After meeting Jesus, Philip invited his friend Nathanael to “come and see” Jesus. We must also invite other people to “come and see” the Lord. Not much is known about James, who shares this feast day with Philip. He is called James, son of Alphaeus, since there were two apostles named James. In the New Testament his name is in the list of apostles, and he was in the Upper Room with the others waiting for the coming of the Holy Spirit at Pentecost. Jesus sent the apostles to share the good news of God’s love for us to the ends of the earth. They were excited to tell people about the new life Jesus Christ brings us. As disciples of Jesus Christ, we, too, should share the message of hope in the Gospels with others. We can show other people who Jesus Christ is by our words and our actions each day. show others who Jesus Christ is in our lives? ■ Brainstorm ways to follow Jesus. 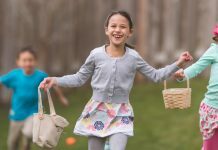 We are called to bring hope to the lives of others by sharing the good news of Jesus Christ at school, in our neighborhoods, and in our world. What are ways to do this? We can invite someone to Mass, make friends with children of different races and cultures, tell someone that Jesus loves them, welcome new children, and reach out a helping hand to people in need. ■ Make a jeweled cross. Use craft supplies to make crosses with the children. Provide foam crosses, self-stick craft foam in a variety of colors, and self-stick jewels. Show the children how to cut squares of self-stick craft foam to put across and down the cross. Then they can add a colorful jewel on top of each square. 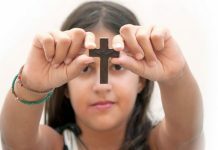 Ask the children to display their crosses at home as a reminder to follow Jesus each day. 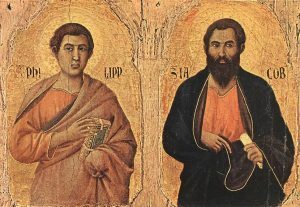 Lord Jesus, you called Philip and James to be apostles and follow you. May we hear your call in our lives and say yes to following you. Guide us to invite others to come and see you. May we witness to who you by all that we say and do. With you and through you, all things are possible. Amen. PATRICIA MATHSON, MRE, has years of experience as a director of religious education. She has authored many books, including 70 Church Year Lesson Starters for Kids from Twenty-Third Publications. 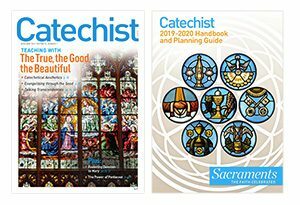 This article was originally published in Catechist magazine, April-May, 2018.